The reception for my solo art show at Medfield TV was great! People were flowing in, mingling, and checking out my art! At the end of the night, local photographer Chuck Ferullo took some photos of me in the space, and I thought they looked like nice headshots! I was so happy to get a full-length shot of me and my outfit - I've been waiting to wear this for two months now, and it's been a little too cold for a skirt! All I can say is, well worth the wait ;) I also had some fun with that last image; I added a canvas in Photoshop, because the wall felt a little bare! Check out the original image, and additional edit with my name, below! Thanks so much for the headshots, Chuck! Paintings by Scott Matalon of Stingray Body Art, 2016. 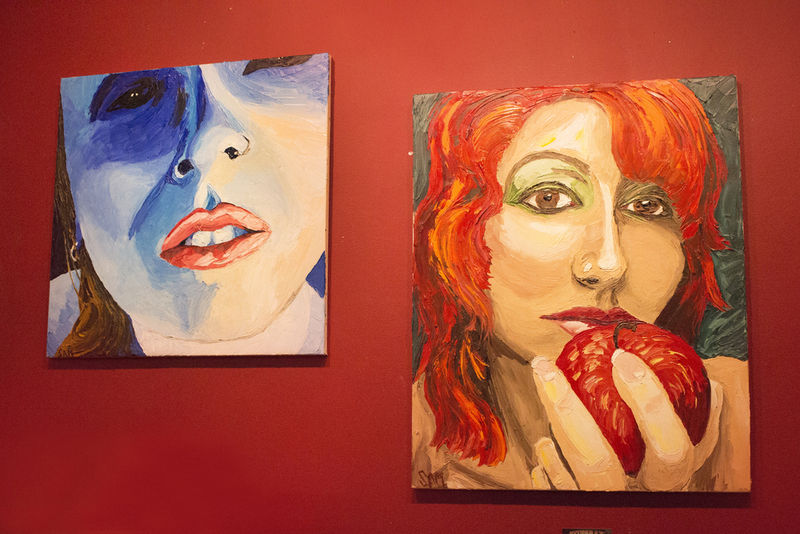 Portrait on right depicts artist Geena Matuson. I had an awesome time at the Stingray Body Art 'Tattoo Artists Art Show' ‬ last week! 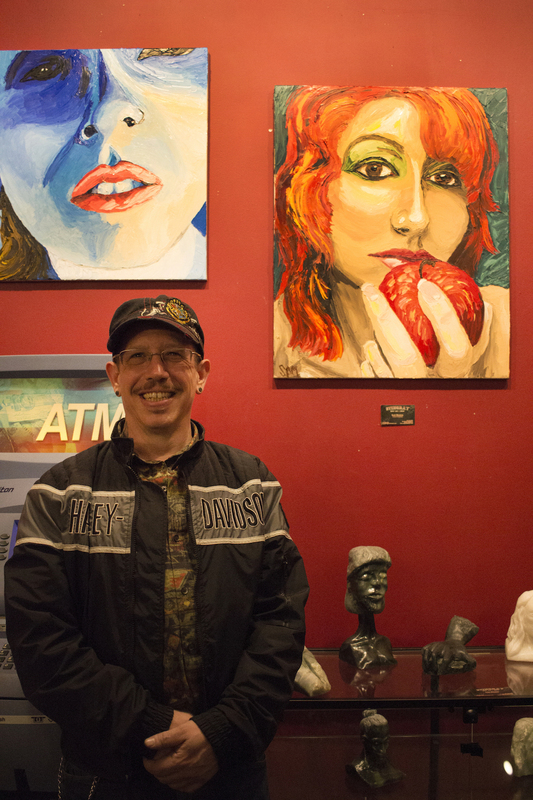 There was some amazing art - including a painting of me circa 2008 painted by Scott Matalon, Stingray Owner, and musician! 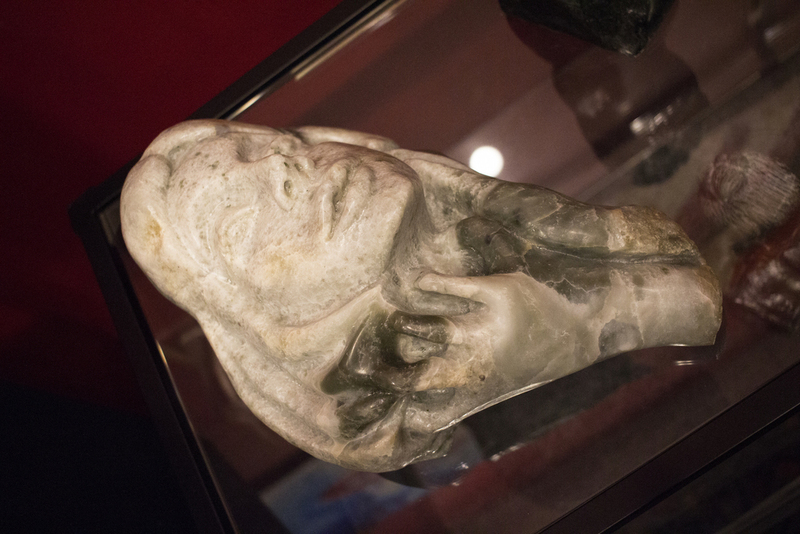 What's more, Scott created a carving of me out of stone, and now I can officially say 'I am immortalized in stone.' It seems sort of like the ultimate thing, right? I still can't process the fact that this man carves stone, and one such carving happens to be my face! 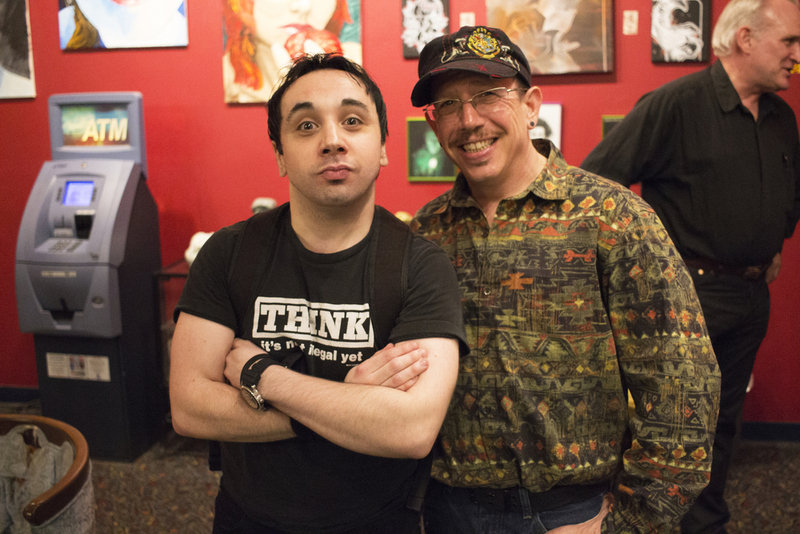 Even more fun with Mike O'Toole of Experimentally ILL Podcast, too, and the music by DJ Lotusound was great! Back in January, I was contacted by an oil painter, Pete Rogers. He'd been following my work for a year, and decided to reach out - he wanted to paint me! In fact, he'd seen my modeling work along with my own artwork, and wanted to do something more than just paint me; he wanted to work together on some exciting new project. After graduating from Harvard where he studied government, he went to sea for four years. Pete served aboard the Coast Guard Icebreakers, and as a diver for three years in the Arctic and the Antarctic. During his time aboard various vessels, he grew fascinated with the industrial machinery, and marine imagery. He began to paint and create both personal work and advertisements based on these images. His work places a strong focus on realism, capturing how the lights and shadows create shapes and deep color with both metal, and water. In 1971, Pete left the service as First Class Quartermaster, and went on to receive his MBA from Northeastern University, a member of the business honor society. Pete became a full-time painter in 1976, and was the second President of the American Society of Marine Artists, and a Fellow of ASMA for 20 years, serving as Vice President in later years. He has had paintings in numerous exhibitions and part of permanent collections in museums, including the U.S. Congress, the Peabody Essex Museum of Salem, and the Mariners Museum. Over the years, Pete has broadened his subject matter to include people, landscapes, industrial subjects, waterfalls, rapids, forests, still lives, cityscapes, and figure painting. I read Pete's impressive and diverse bio, and took a look at his work from a brochure he sent along. I was impressed with his work, and immediately replied with a "Yes!" Sample brochure of industrial, environmental and figure oil paintings by Pete Rogers. I met with Pete and quickly began modeling for his upcoming paintings. 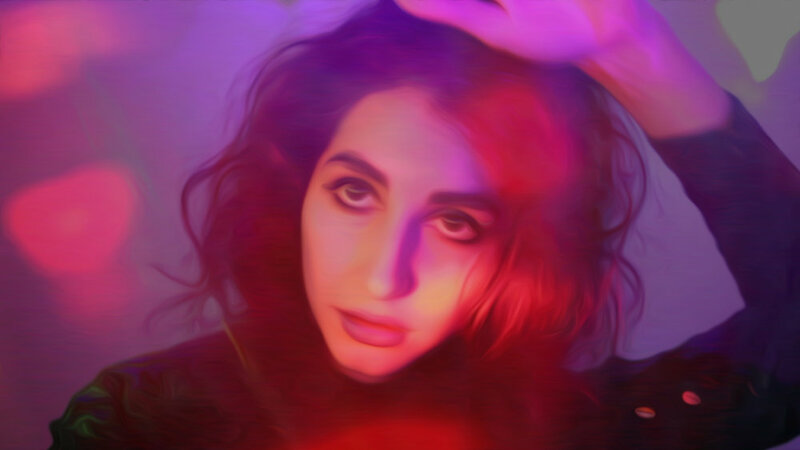 In his studio, I model with different fabrics and pose under an array of multicolored lights while he snaps hundreds of photos which then serve as reference for his paintings. He doesn't consider himself a photographer, however, nor are his photographs part of his art; he simply uses these as a reference. However, once I learned how he works, we came up with the perfect collaboration: I'll take the reference photographs and whip them into digital art. Geena Matuson, Neon Opalescence, 2015. This is more than simply arranging the photos; I'm creating entirely new, unique images through a variety of techniques. There are many different styles I'm using in my work, and this is, as I said, just a taste! In the future, we may produce a gallery show to exhibit the joining of our individual pieces into this colorful collaboration. We may also include videos showcasing the photography process, adding another conceptual layer of 'time' to this project. This work has inspired me in so many ways, I can't wait to see where I go with this! BOND Restaurant & Lounge. Image by CDA Media. Last Friday I was part of the event 'Scene&Style Celebrates' at BOND Restaurant & Lounge in Boston, coordinated by Frank Floyd and Angela Cornacchio. Though I was going to be a featured artist, I ended up modeling in an event fashion show! Artists Geena Matuson (@geenamatuson) and Renée Ricciardi. Image by CDA Media. Geena Matuson (@geenamatuson) wearing Chynna Pope at event fashion show. Image by CDA Media. Renée Ricciardi wearing Chynna Pope at event fashion show. Image by CDA Media. Models Renee Gadsden, Geena Matuson (@geenamatuson) and Renée Ricciardi wear Chynna Pope at fashion show. Image by CDA Media. When the show ended, we all walked with designer Chynna Pope (at back) while we did that really-awesome-fun-fashion-show-awesome-I-love-it-so-much-OMG-it-doesn't-make-me-feel-like-a-douchebag-at-all-everyone-loves-it-clap! Left, Renee Avi Gadsden, Geena Matuson (@geenamatuson), Chynna Pope, Renée Ricciardi, Jocelyn Kelley, Nicole Spiller in 'Scene&Style' fashion event. Geena Matuson (@geenamatuson) with Chynna Pope at 'Scene&Style' event. Image by CDA Media. Geena Matuson (@geenamatuson) photographed by CDA Media. If you're curious about the first outfit I wore for the show, and the artists behind my amazing hair and make-up, check out these quick cellphone snaps taken behind-the-scenes! The amazing, architectural hair was done by Charles Maksou of Che Maksou, and my make-up was done by the lovely and talented make-up artist Mau Namidrah of Makeup by Mau.